Enjoy $1.09 Off Coupon at checkout! Our standard terry towel collection is made with high quality, 100% genuine Turkish cotton. They are soft to the touch and become even softer after the first wash. These towels are also highly absorbent, durably made and long lasting. With a double stitch edge and natural dobby weave, these towels are an elegant addition to any bathroom. 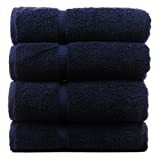 Set includes 4 standard size Bath Towels, measuring 27″ x 54″.